Bless, friends of the Cannapot Hempshop - we are happy that you want to order at our small onlinestore and here you can find a short video with a short tutorial how you can order your favourite cannabisseeds here online very easy. 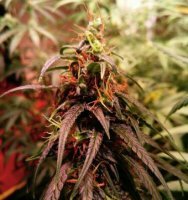 If you visit our side directly over our Welcome Page you have the possibility to choose your language (english, spanish or german), after that just click on 'ENTER SHOP' to access the main store where you will find all different weedseeds and cannabis strains. When you are in, you can choose between a few different options: on the right side of the page you see the bestsellers, the section specials is visible at the top and on the right side of shop. All new products can be found on the top and you see a sector called 'New Products' on the left, there is always one new strain shown randomly. 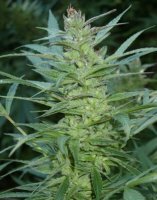 The categories where you find all breeders and the whole product range is on the left side, if you scroll down and look at the left you will also see the latest auctions running at our cannabisseeds auction exchange. By the way, it is also possible to change the language and your currency on every page of our shop on the very top. Once you have found the strain you are searching for (in this sample it is C99 by Brothers Grimm) just click on 'BUY NOW'. This will lead you to the shopping basket where you can change the quantity to update your cart, it is possible to continue shopping if you want to add more products to your basket. If you have everything and you want to finalize the order just click on 'CHECKOUT'. Ok, now as you have everything it is time for the account - if you have never ordered before at Cannapot or if you do not have an account and you want to create one, choose the option 'SIGN UP'. If you are a already registered customer please use 'Returning Customer'. If you just do not want to have a permanent account please take 'Checkout Without An Account' and note that you will always get an update when the orderhistory is changing, it is not necessary to have a permanent account for getting these important informations. When you inform us that you have received the order, we are going to delete it from the system. If we do not get any mail we delete it automatically after eight weeks. The next section is very easy to understand, please provide all your informations and your correct address and please use a VALID e-mail address, this is very important for your order. Move on to the next window - please check your correct delivery address, if you want to tell us anything just use the box 'Comments' at the bottom. At the next page you have a little bit more things to choose. First, check 'Terms and Conditions' carefully, read the conditions and accept them to finalize the order-process. If you have a discount-coupon just insert the redemption code and choose a 'Shipping Insurance' if necessary, all orders over hundred euros in total are sent registered automatically. Next, you can use the possibility of a 'Stealth Shipping', if you want this option we will send the seeds outside of the original breeders packs. And the last step is choosing your 'Payment Method'. Just take what you prefer and go on by hitting the 'Continue' button. So last but not least, the final chapter of this small journey, again please check your details that nothing goes wrong - after you have done just click on 'BUY NOW'. You have just gone through to order-process successfully. Be careful because of the final information you get on the last page: this is very important - please check your spamdirectory at your mailprogram. It can happen that freemailer like AOL, Yahoo, Gmail, Lycos or GMX send the orderconfirmations into the spam automatically. Many onlineshops have these troubles, this is just because many freemailer do not like automatic created mails and a confirmation is always sent by the system and it is not written by humans. If you find the mail in the spamdirectory please 'unspam' it for further actions.